A condition is a desired behavior of an indicator or plot (e.g. 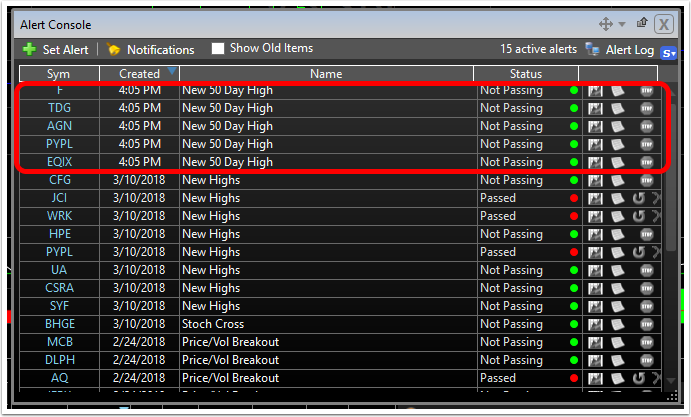 price at a new 50-bar high or Stochastics crossing its %D.) An individual condition or more than one condition can be combined to create an alert. 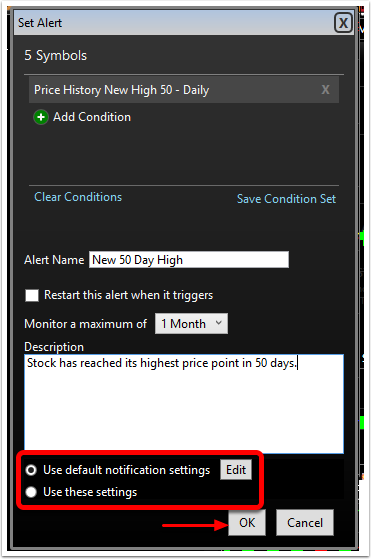 Alerts can be set on individual or multiple stocks. 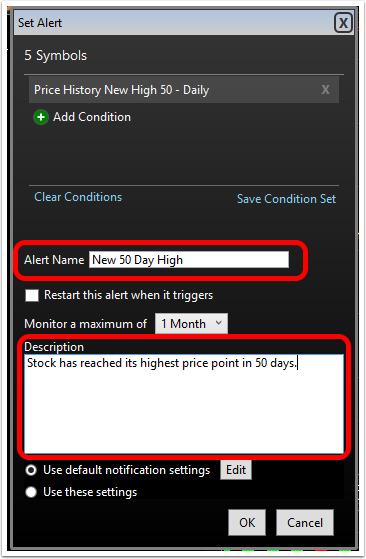 Here are the steps to create conditional alerts on multiple stocks. 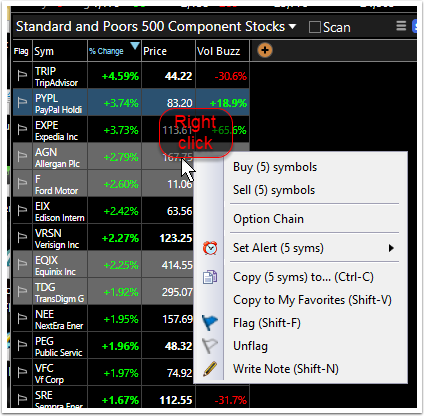 For a list of symbols: click on the first desired symbol, hold the Shift key down on the keyboard and click on the last desired symbol. 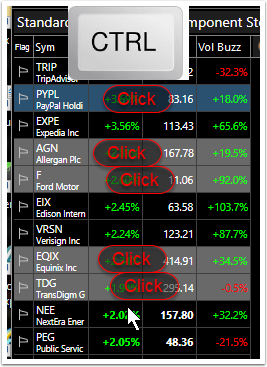 For random groups of symbols: click on the first desired symbol, hold the Control (Ctrl) key down on the keyboard and click each desired symbol. 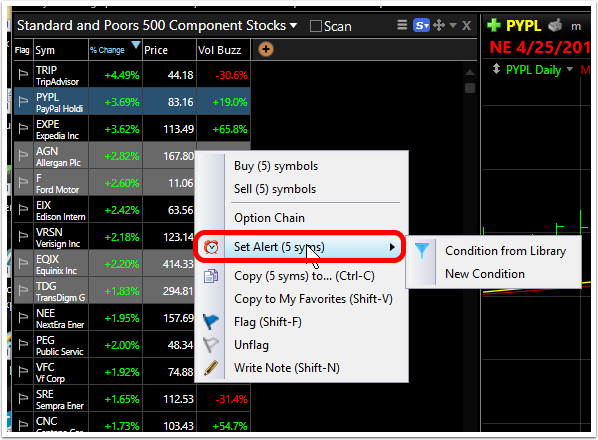 To set a Conditional Alert on a single stock, simply highlight one symbol instead of a list. 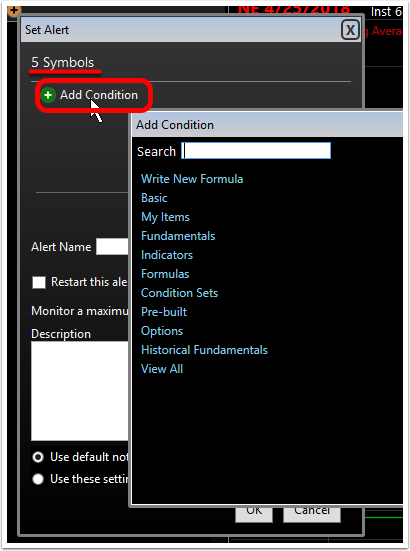 To use a Condition or Condition Set from the saved condition library, select Conditions from Library to choose the condition/condition set. 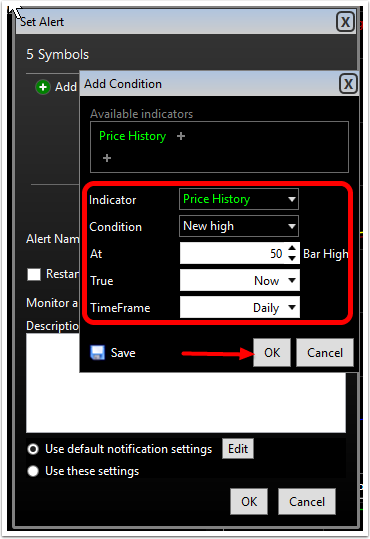 Use the Condition Editor to set the desired parameters (this example is price reaching a new 50 bar high). 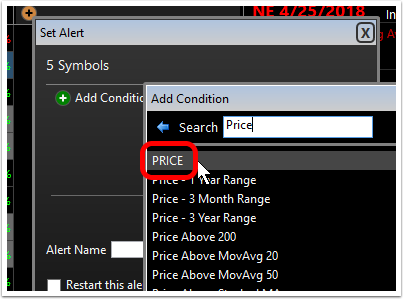 Click OK to add condition. This adds the condition to the Set Alert menu. 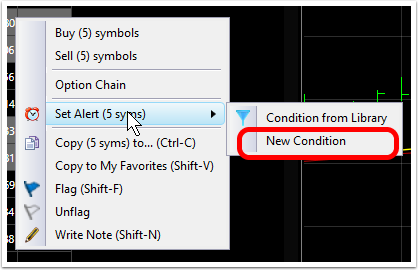 Click Add Condition to add more conditions and create a Condition Set. The entire set of conditions would have to be met for the Alert to be fired. 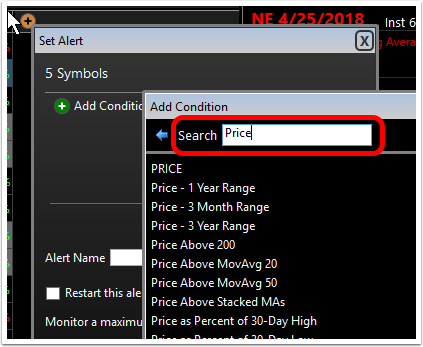 Name and create a description for the Alert. 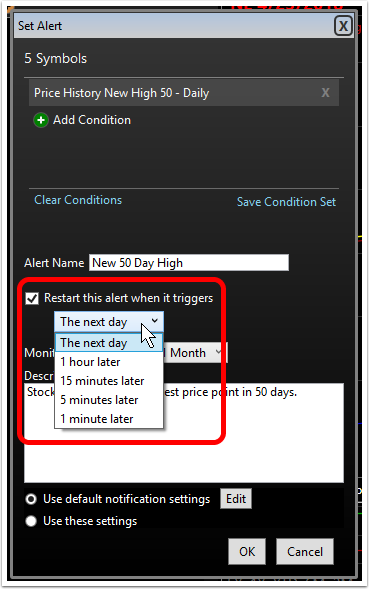 When an Alert is delivered (via text, email, pop-up message in software) the description you create will be included. 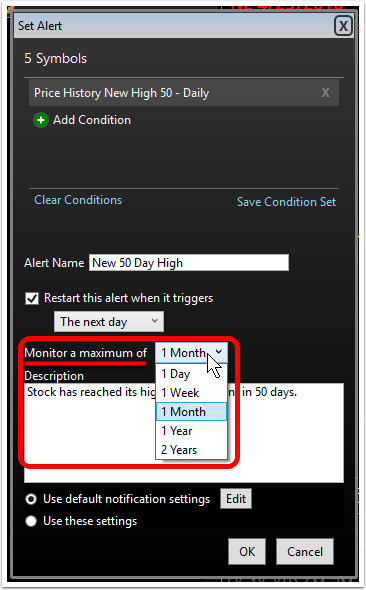 For more on Notification Settings, click here. 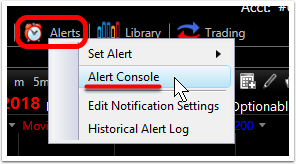 The Alerts set will appear at the top of the Alert console with full details about the Alerts. 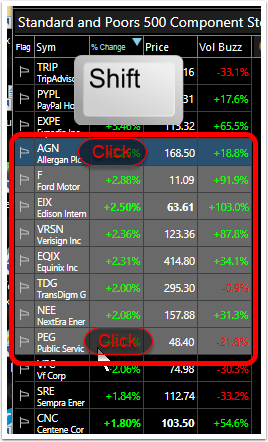 NOTE: the maximum alerts that can be monitored at the same time depends on the service level of your TC2000 subscription. Silver: 5 maximum; Gold: 100 maximum; Platinum: 1,000 maximum.